On the lead up to Remembrance Day and the 100th Anniversary of the end of World War 1, the children of St Michael's Primary School were joined by children from Bulford St Leonard's, Larkhill and Pembroke Park to watch the thought provoking play, The 11th Hour..
Prime Theatre Company set up a War World 1 trench in the middle of the school hall and the children watched the story of two soldiers during the last hour of the war. The play was written especially for Wiltshire school by Terry Deary, author of the Horrible History books. 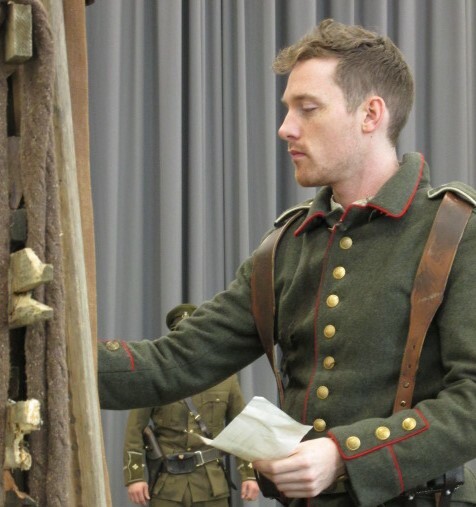 The 11th Hour was full of humour, drama, emotions and facts and really brought to life the terrible conditions and danger the soldiers lived in. Highlights from the play were when the two soldiers from either side had a 'dance off', sang Silent Night, reenacted the Christmas truce and compared their time in the trenches. The children of St Michael's Primary enjoyed learning with the cast during workshops in the afternoon. 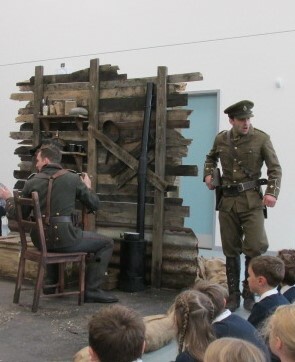 They were able to ask the soldier's questions about their experiences as well as learn some drama and acting skills.